Northern Pines is a premier CNY public golf course that is open ALL YEAR ROUND either indoors during the winter months, or outdoors in the summer months we have the tools to better your golf game! Northern Pines is a soft-spike course only. Proper Dress Code includes: Golf Apparel. Men: Collared Shirts, Shirts without sleeves, Dress Shorts or Bermuda type length. JEANS ARE NOT ALLOWED. A key characteristics of Northern Pines is that it is composed of two distinct courses. The front nine, as well as two of the back nine holes, numbers 15 and 18, were built in 1998 and designed by local architect Barry Jordan. The new holes feature a traditional Scottish links style, with large rolling hills and mostly open terrain. The eleven new holes have large undulating greens and multiple teeing areas. Four large ponds, which come into play on seven of the eleven new holes, as well as thirty-four sand traps were also built to add to the challenge. A key consideration during the design and construction of the new holes was preservation of the area’s native wetlands. Numerous wetland areas were constructed and integrated into the design of the course. The greens are constructed to modern USGA specifications, composed of a predominately sand-based root-zone mixture. The rest of the course was built using native topsoil obtained during the construction process. The new greens were seeded with L-93, a top variety of creeping bentgrass. 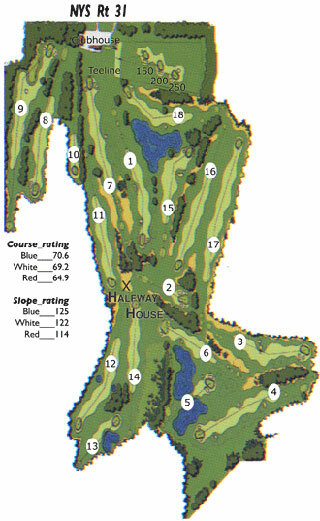 The fairways and tees a composed primarily of perennial rye grass, and the roughs of predominately fine fescue. The new course has a modern tee-to-green automated irrigation system. The original course – holes 10 through 14, 16, and 17 – were built in the late 1960s and designed by architect George Swatt. The holes have a traditional parkland setting style. A key characteristic of the old holes is the very challenging small greens that tend to fall away around the edges, creating very small targets for approach shots. Three small ponds, coming into play on two of the seven old holes, add to the challenge. The old greens were constructed to older soil-based root zone specifications. Their shape in design, however, creates surfaces that drain well, and they have held up and performed very well for 35 years. The greens are comprised of an old variety of bentgrass. With very little of the annual bluegrass invasion so common on greens in the Northeastern U.S., they still look and perform excellently. The fairways and tees of the old course are very similar to the new course. Perennial ryegrass is the predominant species, and the roughs are a mixture of bluegrass, rye, and fescue. Although the old course doesn’t have the length and extensive bunkering of the new holes, the large trees, well-placed water hazards, and difficult greens challenge golfers of all skill levels.